The secret to shortening pants evenly is exactly the same as the one I shared with you in the article about how to properly shorten a dress – but with a few caveats. Many people make the same old mistake and end up with uneven looking pants. This includes dressmakers who take shortcuts in order to save time. Because pants with uneven legs look much worse than unevenly shortened dresses, it is even more important to do it right. People always take a notice of unevenly shortened pants, so don’t be the one who gives them a reason to talk about yours. 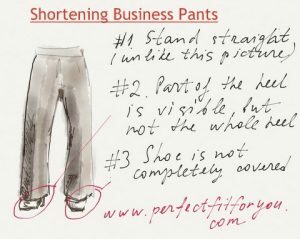 Read on to understand simple rules for shortening your pants. The secret is simple: you have to try them on, and let someone else mark both legs on you. Let a seamstress or someone else pin them on the back. Unfortunately, you cannot do it yourself, because you have to stand straight while your pants are marked on the back. It’s because in order to see yourself in the mirror from the back, you have to turn a little bit, and your pants’ position changes; so, one leg will be pinned shorter than the other. Besides, to pin them, you have to bend and they go up. On top of that, from my experience, most people have slight difference between the length of their legs. The whole posture can be a little bit off by ½ inch, and it is not visible until you try to shorten your pants without trying them on. So when someone wants to shorten both legs evenly, you know what to do: just politely say no, then try your pants on, and have them pin both legs on you. Do not forget to do the pinning with proper shoes on. Skinny pants are in fashion, and you can wear them with both flats and high heels. However, boot cut pants are best with certain height of heel, and you are not so flexible in your choice of shoes. So make your choice before you cut your pants. Wear the heels you will be wearing with these particular pants. They are too short if you can see almost the whole heel. They should be about 1 inch from the ground. If you are wearing skinny pants and they are all folded on the bottom, they are too long. It makes your perfect legs look crooked. Email me to shorten your pants properly ( and quickly). I am a professional dressmaker located at Bayview and Moore in Toronto.